'On 12 Saturdays, we can be the best football team.' Iowa State almost played for a Big 12 title in 2017—but how will they handle real expectations now? Plus, support for the Olympic model of amateurism and the rest of this week's Punt, Pass & Pork. That disappointment drove the Cyclones through an offseason. Last January, coaches showing around recruits on an official visit weekend in January found tailback David Montgomery working out alone at 9 p.m. on a Friday night. Weeks passed, and Montgomery wasn’t alone anymore. His teammates had joined him, and together they laid the foundation for Iowa State’s best season since 2000. What was the only team in the Big 12 in 2017 to beat both participants in the conference title game? That would be Iowa State, which won at eventual league champ Oklahoma on Oct. 7 and then knocked off eventual runner-up TCU in Ames three weeks later. The 8–5 Cyclones still suffered from some of those inconsistencies, blowing fourth-quarter leads against Oklahoma State and Kansas State. (Had they held those leads, the Cyclones would have played Oklahoma for the Big 12 title instead of TCU.) But the improvement was obvious. Iowa State was in every game it played and could beat anyone on a given day. The Cyclones also are much deeper at quarterback than Campbell thought they’d be when last season ended. Iowa State asked the NCAA if Kyle Kempt could receive a hardship waiver for an extra year of eligibility. Kempt began his college career at Oregon State in 2013 and redshirted. He left Corvallis following a coaching change after the 2014 season (Mike Riley took the Nebraska job and Gary Andersen was hired) and transferred to Hutchinson (Kan.) Community College in 2015. Kempt walked on at Iowa State in 2015. Campbell thought the sixth year was a bit of a long shot, but in late January, an NCAA panel examined the circumstances of Kempt’s transfers and granted the sixth year. Kempt threw for 1,787 yards (7.4 yards per attempt) and 15 touchdowns with only three interceptions in nine games last season. Meanwhile, redshirt sophomore Zeb Noland filled in for an injured Kempt against Oklahoma State and then led Iowa State to a win against Baylor as the starter the following week. So Campbell will go into the season knowing he has a capable starter and a capable backup. Now comes the tricky part. For the first time in years, the Cyclones must deal with expectations. They look capable of building on last season’s success, but now that the world has seen them beat Oklahoma and TCU, no opponent will take Iowa State lightly. Even the easiest games will get harder because the Cyclones have lost the element of surprise. Campbell understands the challenge of high expectations better than most. He played on three Division III national title teams at Mount Union, and then he returned as Mount Union’s offensive coordinator and helped the the Purple Raiders win national titles in 2005 and ’06. Campbell loved playing for Mount Union coach Larry Kehres, but Campbell considers his stint working for Kehres as a Ph.D. program in coaching football. In terms of constantly fulfilling expectations in college football, the only peer Kehres has is probably Alabama’s Nick Saban. Thanks to his time with Kehres, Campbell believes he has a good idea how a team facing higher expectations should act in the offseason. And Campbell seems pleased with how his Cyclones have handled these past few months. “Ego is the first thing that can really damage what you’ve done,” Campbell says. “And our kids really came in with great humility and and went back to work—which I was really proud of.” The work will continue through the summer. Then a ridiculously front-loaded schedule that features games against Iowa, Oklahoma, TCU, Oklahoma State and West Virginia in the season’s first seven weeks will tell us if the Cyclones are capable of capitalizing on success and then building on it. I went to a movie at a theater in a new open-air mall over the weekend, and I began thinking about the day—which seems to be coming soon—when enclosed malls are a rarity. This got me thinking about all the mall stores that have already vanished. So this week, we’re ranking the best defunct mall stores. They sold beef ropes by the foot. I don’t need to say anything else. This company still exists in online and catalog forms, but it just isn’t the same as being able to go to the store next door to Foot Locker and buy eight feet of beef and a cheese basket. I don’t think we ever bought anything there—which probably explains why the company doesn’t have brick-and-mortar stores anymore—but the massage chairs always seemed like the ideal place to wait while my mom perused Casual Corner. The only purchase I ever made at one of these? Multiple sets of Superman cufflinks to give to my groomsmen for my wedding. Believe it or not, there simply wasn’t enough demand for Marvin the Martian merchandise to keep these stores going. As the big-box bookstores cling to life, it seems incredible that there were once smaller versions with even higher prices and less selection. Once Circuit City, Wal-Mart and Best Buy started selling CDs for $11.99, only true suckers bought discs for $16.99 at the mall. But the impulse could be strong when that Stabbing Westward CD was just staring you in the face and Circuit City was a whopping two miles away. Yes, this store essentially still exists as Express Men. But it’s just not the same without the pleats on the pants and the columns on the tag. Yes, there was entire big-box store full of toys in the shopping center next door. But that didn’t help when dad was sifting through the Doobie Brothers section at Sam Goody. At least you could get a look at the new series of G.I. Joe and Transformers here and then beg your mom to buy them on the next trip to Wal-Mart. Like Structure, but with dad and mom jeans. You had to buy your No Fear T-shirts somewhere. This store probably went out of business when it failed to land the contract to dress the cast of Parker Lewis Can’t Lose. Or maybe it went out of businessbecause it landed the contract to dress the cast of Parker Lewis Can’t Lose. 1. Two pronouncements last week should have the leaders of schools—the people who actually make the NCAA’s rules—looking hard at my 2011 column on why the Olympic Model would help college sports deal with potential legal issues relating to the schools’ (probably illegal) price ceiling on the athlete labor market. First, former Secretary of State Condoleezza Rice told USA Today that she believes college athletes should be allowed to profit off their own names and likenesses. Some thought this was an about-face from what Rice, the chair of the NCAA’s blue-ribbon committee that recently examined college basketball, said when she announced the committee’s findings last month. It wasn’t. She said the same thing in the tamest way possible while inside NCAA headquarters on the NCAA’s dime. Then, once outside, she came with the full-strength opinion. On Friday, the Raleigh News & Observer published an op-ed by U.S. Rep. Mark Walker (R-N.C.) that said essentially the same thing. The chair of the Republican Study Committee also suggested congressional action may be required to allow athletes to make money off their names. (All politics being local, this may be retaliation for the NCAA’s decision to pull events from North Carolina because of its bathroom bill.) The leaders of the NCAA and the schools have always believed that if the courts got close enough to opening up the athlete labor market that Congress would swoop in and save the cartel with an antitrust exemption. The lobbyists hired by the NCAA and the conferences are relying on Republicans to do this, thinking they’ll happily embrace the status quo. But judging by these recent pronouncements by high-profile Republicans, these people may have miscalculated. Perhaps they forgot that Republicans tend to like open markets—not arbitrarily capped markets. This will be fascinating to watch going forward. The people in charge of college sports thought they’d have the legislative branch on their side even if the judicial branch wasn’t. They’re probably going to lose Jenkins vs. NCAA, and it may turn out that they don’t have the congressional safety net they expected. 2. Ohio State quarterback Joe Burrow has visited Cincinnati and LSU and now will decide where he wants to transfer for graduate school. Burrow left Baton Rouge on Sunday with no choice made. He’ll be able to play immediately, and he’ll have two seasons of eligibility at whichever school he chooses. 3. Washington State coach Mike Leach was in Cambodia last week. Meanwhile, West Virginia coach Dana Holgorsen—a former Leach assistant—was in ... Houston? I realize the Skechers lawsuit against Adidas is about the ability of Skechers to sign NBA players to shoe deals. But I’d love to see Skechers try to break into college athletics. The burnt orange light-up cleats at Texas would be spectacular. The mid-’80s introduction of the Chocolate Hostess Pudding Pie was a seminal moment in the fattening of young Andy. A stop at a gas station on a road trip meant a furious hunt for that glorious soft shell filled with rich, gooey chocolate pudding. Later, I’d branch out to Hostess apple pies and cherry pies as well as McDonald’s apple pie. The idea of a self-contained, handheld pie—a pie calzone, if you will—always fascinated me. But as I got older, I began actively avoiding foods designed to survive nuclear winter. (Also, Hostess discontinued the pudding pies.) I figured my days of eating handheld pies on the road had long since passed. But during a swing through Norman, Okla.—on March 14, no less—on my way to Dallas, I learned that I’d pass something glorious while driving south on Interstate 35. If I got off in Davis, Okla., and made a right and then an immediate left, I’d come upon a place that would fulfill all of eight-year-old Andy’s handheld pie dreams. 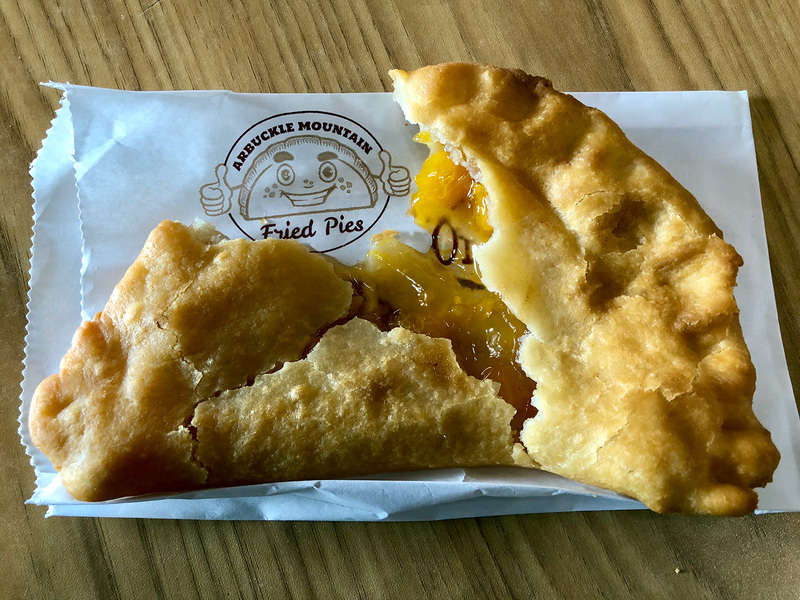 Behind the counter at Arbuckle Mountain Fried Pies is a factory pumping out hand pies by the thousand. But these aren’t being packaged to sit on a gas station shelf for years. They’re fresh and ready to be eaten immediately. There’s apple, blackberry, peach, cherry and apricot. There’s chocolate, vanilla, lemon and coconut cream. There’s pecan. There’s a pie that essentially has beef stew inside. There’s a bacon, egg and cheese pie at breakfast. My greatest regret was that I had but one stomach. My childhood run-ins with hand pies had taught me how heavily they sit in the digestive system. One pie probably was enough. Two was pushing it. But I couldn’t try only one. So I ordered the chocolate—to see how it compared to my memory of the Hostess Pudding Pie—and the peach. The chocolate was wonderful. It has a flaky, tender crust that gave way to oozing chocolate cream. The ’80s Hostess version couldn’t hold a candle to a pie that had been in the oven minutes earlier. But as great as that chocolate pie was, it was about to take second place. Once I bit into the peach, I realized no pie I’d ever have to slice out of a wheel would ever compare to the one in my hand. It had the same flaky crust as the chocolate pie, but inside was a sweet, tart goo cradling chunks of peach. The pie got better with each passing bite, and the form allowed for the ideal distribution of peach, filling and crust. I didn’t have to collect the various parts with a fork and then separate them into the proper proportions before chomping down. Arbuckle Mountain Fried Pies had already done that for me. I just had to pull it out of the bag and open wide.